After our dinner, while we were finishing our red wines, no one had room for any dessert, and we had planned on making Bananas Foster, that grand dessert from the French Quarter of New Orleans. The conversations were flowing and the time was well spent. We waited awhile, and still there was no room for dessert. Of course there is always some room for dessert wines and we opened up a bottle. Oliver and Nina had brought a special dessert wine for the dinner, and it was special. 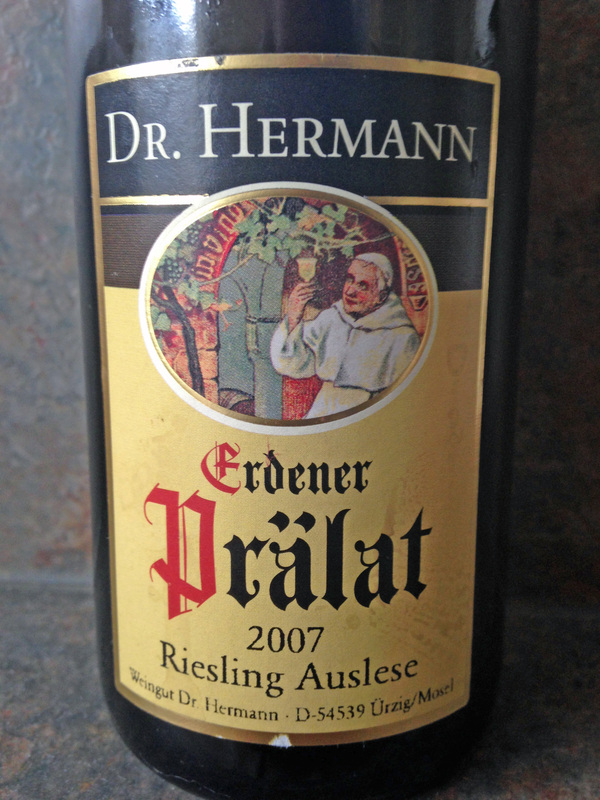 It was a bottle of Dr. Hermann Erdener Pralat Riesling Auslese 2007. Oliver was especially pleased with his selection as it was the perfect ending that had started off the evening with the Erdener Treppchen Riesling Auslese 1971. Both of the wines were from the same village, whereas Erdener Treppchen is considered an Erste Lage, the Pralat is considered another great block of Erden, but since the producers as best as I can discover are not members of the VDP or Verband Deutscher Pradikats-und Qualitatsweinguter (The Association of German Quality and Pradikat Wine Estates) the land cannot be endowed with any awards or designations. The Pralat is a four acre parcel known for its red slate soil and great wines. This wine was everything that one wanted from a wonderful dessert wine, and it was great to be able to balance it against the 1971 bottle which was much more mature compared to this youthful 2007. The conversations were still flowing and we had finished the first bottle of dessert wine and I went into the cellar to find something interesting. If there really is a category that is lacking in my cellar, I would have to say that it is in the dessert wines, as we normally do not drink these at home, only when we are having a four start dinner at a restaurant. I found a bottle of wine that I was told was very similar to a Sauterne or a Barsac, but the vineyards are on the opposite bank of the Garonne River. 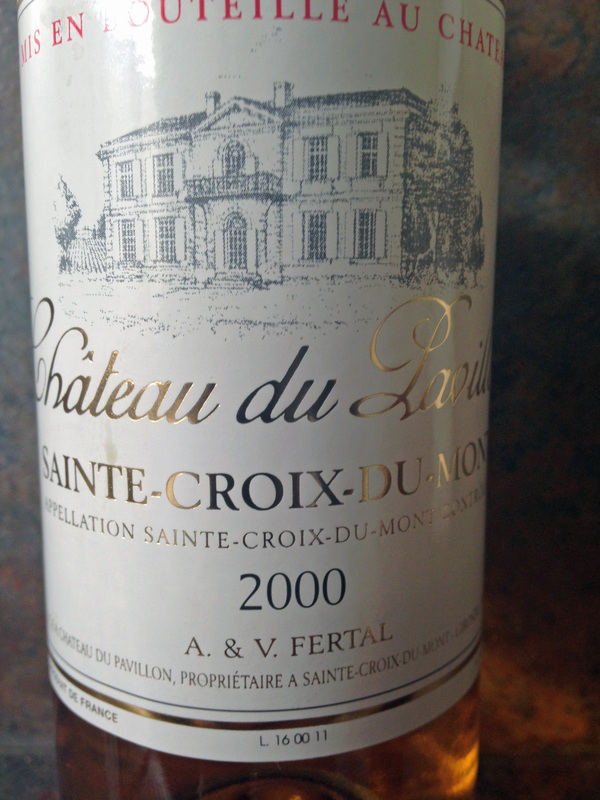 Chateau du Pavillon Sainte-Croix-du-Mont 2000 was what I brought up. The wines from this district are made from Semillon, Sauvignon Blanc and Muscadelle, and Sainte-Croix-du-Mont is an AOC designation for sweet wines from Bordeaux, a sub-region of the Entre-Deaux-Mers district. This would have probably been a fine dessert wine, but it did pale in comparison after having the Erdener Pralat which had a lot more body and nuance. Perhaps from now on, I should do a little more research in this area for future stocking of my cellar. This entry was posted in Wine and tagged Auslese, Bordeaux, Chateau du Pavillon, Dr. Hermann, Entre-Deaux-Mers, Erden, Erdener Pralat, France, Germany, Mosel, Muscadelle, Riesling, Sainte-Croix-du-Mont, Sauvignon Blanc, Semillon. Bookmark the permalink. After reading your notes for the Riesling Auslese, I have to say it looks delicious. I never knew that Dr. Hermann wasn’t part of the VDP – that’s quite interesting. I wonder what their motivations are not to join them..
Anyways, it sounds like you guys had a wonderful evening. Cheers! I thought both wines were delicious, John, and I am glad you opened that 2000. I think it’s hard to stand up to a youthful Auslese with all its fruit and freshness, and this wine was somewhere in the middle of its ageing process, which I enjoyed tasting. Oliver, I was hoping that you would chime in on the VDP question, as I could only find part of the story. Thank you.